Box art from some of the most valuable PC Games. PC games are not well known for their collectability, especially when compared to rare games for popular video game console systems such as the Nintendo Entertainment System. PC games don't hold their value very well and the platform simply doesn't have many of those hard to find and highly sought after titles. This is mostly due to the fact that PC games are one of the most readily available types of video games that can be obtained, whether it be by legal or illegal means. Legal digital distribution of PC games through download services and distribution platforms such as Steam have changed the landscape of PC gaming. PC game piracy and older games being abandoned or released as freeware have been equally influential in the distribution of PC games. The combination of these has diminished the need or desire for PC gamers to own a physical copy of a game. Despite the limited value and collectability of PC games, there are some highly sought after titles that can fetch a pretty good price on secondary markets such as eBay. 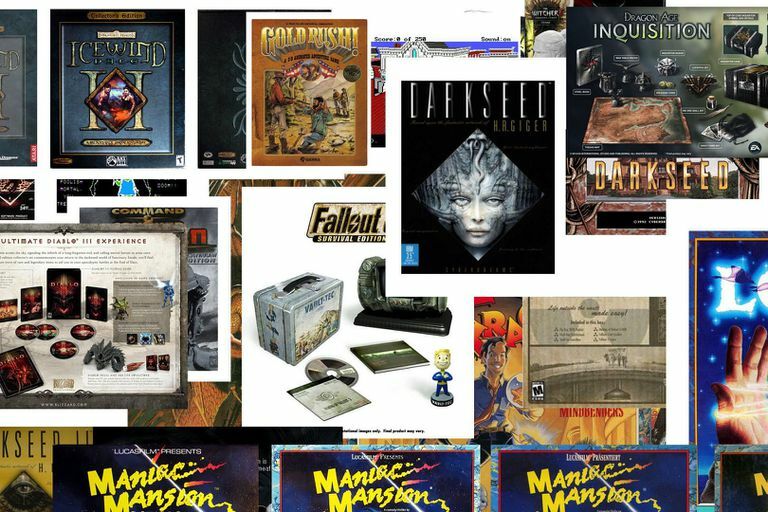 The list that follows are some of the most valuable PC games and include both older titles as well as limited collector's editions of newer releases. The criteria used for the most valuable PC games list was PC games that have sold on eBay over the past 90 days as of July 2015 and includes mainly Auction listings but does include a few Buy It Now listings. We scrutinized these more than others to weed out possible phony bids/Buy It Now prices. Dark Seed II Box Art & Screenshot. Dark Seed II is a point and click adventure game with a psychological horror theme. It is also the sequel to Dark Seed and continues the story of set in a world based on the artwork of H.R. Giger. The game was available for PCs running MS-DOS/Windows 3.x, Sega Saturn, and PlayStation. A new/sealed PC version of the game has fetched $255.00 making it the 25th most valuable PC game. Used big box copies have sold for $99. Other used copies only the CD-ROM jewel case are worth considerably less with prices ranging from $10 to $25. Gold Rush! Box Art & Screenshot. The 24th most valuable PC game is Gold Rush!. The graphic adventure game from Sierra On-Line was released in 1988 and is one of the last games developed by Sierra using the Adventure Game Interpreter game engine which was developed for Kings Quest: Quest for the Crown in 1984 and used for more than a dozen Sierra On-Line adventure games. The recent high sale price for Gold Rush! was a sealed version of the IBM PC/MS-DOS released on both 3.5" and 5.25" floppy disks. However, don't expect to get those kinds of prices for a used copy as prices range from around $10-30 depending on condition. The Apple II version is a bit harder to find and does seem to fetch more than the IBM PC version with prices ranging from $42 to $163.50. id Anthology Box Art - Front Cover. id Anthology was a collection of all of the games developed by id Software up until the time of its release in 1996. It includes 19 games on 4 CD-ROMs and includes all of the various versions of the Doom games that preceded Doom 3, all the Commander Keen games, the Wolfenstein games, Quake and much more. In addition to the games, the id Anthology includes a book of the history of id Software, T-Shirt, Doom Comic, poster and more items that have become highly sought after by collectors. Recent auction listings range in the mid to high $200s for complete copies. The Scroll & Daughters of Serpents Box Art. The Scroll is a graphical adventure game that has a distinction of having value mostly based on how bad the game was. Originally released in 1992 as Daughter of Serpents it received overwhelmingly negative reviews from critics and adventure game fans alike. It was subsequently updated and re-released in 1995 as The Scroll. It is this second release as The Scroll that has become somewhat valuable. The only recent listing of the game sold for $292.87 and the game is rare enough to fetch pretty good value for those that can find a copy. The earlier Daughter of Serpents is easier to find and sealed copies have gone for around $100. That being said, the game can be found on a number of abandonware websites if you want to put yourself through some painful graphical adventures from the mid-1990s. Rise of the Robots Directors Cut Box Art & CD-ROM Manual. Rise of the Robots is a cyberpunk-themed fighting game in which all characters and players are robots based on robots from films such as Terminator, Robocop and Blade Runner. The game was not well received and had a number of problems with graphics and animation performance which made the game quite difficult to play. Much like The Scroll, Rise of the Robots could be earning its value and collectability from how poorly the game was received and the limited availability of the Director's Cut edition. Other listings of the standard edition don't have a lot of value selling in the $10-50 range depending on the platform and condition. Dark Seed Box Art & Title Screen. Dark Seed is a point and click graphical adventure horror game set in a world based on H.R. Giger's artwork. Dark Seed, when released in 1992, received mixed reviews due to some gameplay elements that forced a time limit on completing an object which ultimately forced players to repeat gameplay over and over. The game was, however, somewhat groundbreaking for the horror genre/theme and was one of the first point and click adventure games to use 640x400 resolution. A new factory sealed copy of the game recently sold for $305, but other used copies of the game without the box can be easily found for under $20. Uninvited - Original Apple II Box Art and MS-DOS/Windows Box Art. Uninvited is a point and click adventure game that was developed in 1986 by Mindscape for the Apple Macintosh and then released for MS-DOS in 1987. Additional ports of the game included Atari ST, Commodore 64, and Nintendo Entertainment System. The gameplay consists of players trying to guide the main protagonist through a sorcerer's house to rescue a sibling. The game received very favorable reviews when released for all platforms. The PC version of the game is one of the more rare versions of the game fetching a price of $309. The Mac and NES w/ box have sold for around $100. Loose NES copies range from mid-$20 to $50. Icewind Dale II Collector's Edition - European Box and US Box (front & back). Icewind Dale II was the last Dungeons & Dragons based computer role-playing game developed by Black Isle Studios. Released in 2002 it received very favorable reviews continuing the story of the region of the Ten Towns 30 years after the original. The Icewind Dale II Collector's Edition was released along with the standard edition and contains bonus materials such as the game soundtrack, cloth map, collectible trading cards, spiral bound manual, set of dice and stickers. A new, factory sealed copy of Icewind Dale II Collector's Edition sold for $325, a used standard edition is considerably less valuable and can be found for under $25. The Witcher 2: Assassins of Kings Collector's Edition Box and Contents. The action role-playing game The Witcher 2: Assassins of Kings was released in 2011 and received very positive reviews from fans and critics alike. CD Projekt Red released a collector's edition for the game that retailed for $129.99 and came with a number of collectible items such art book, Geralt bust, cards, coins, but it also included in-game items such as armor that were only available to those who purchased the collector's edition. Recent auction listings have a sealed, unused copy having sold for $335.00. Other complete versions have sold in the mid $200s, while used copies around $100. Command & Conquer Tiberian Sun is the third game in the Command & Conquer series of real-time strategy games but is the follow-up to the first game of the series. In it players control Global Defense Initiative or the Brotherhood of Nod as the fight for control of the valuable resource tiberian. In 2010, Electronic Arts released the game and its expansion as freeware and it is still available from a number of third-party sites. That being said, the Platinum Editions is still highly collectible. Copies are sequentially numbered and include bonus items not found in the standard edition. These items include the original soundtrack music CD, limited edition game manual with concept art, and pewter figures. A factory sealed copy of Command & Conquer Tiberian Sun Platinum Edition has sold for $365.00, used copies can be seen selling in the neighborhood of $100. Diablo III Collector's Edition Box Contents. The action role-playing game Diablo III was released in 2012 and received overwhelmingly positive reviews. Like many other highly anticipated games a collector's edition was released along with the standard edition. The Diablo III Collector's Edition, in addition to the Diablo III full game, includes a behind the scenes DVD, art book, soundtrack 4GB USB drive pre-loaded with Diablo II and Diablo II Lord of Destruction, and exclusive digital bonuses for in Diablo III as well as World of Warcraft and Starcraft II. The game has a recent high price of $400 for a new factory sealed edition with other factory sealed ranging in the mid $300s. Dragon Age: Inquisition is the third game in the Dragon Age series of computer role-playing games from BioWare in 2014. It has received many favorable reviews and role-playing game of the year awards for 2014. The Inquisitor's Edition of the game was only sold through GameStop in limited quantities so it is a fairly hard title to obtain, especially the PC version. The PC version has sold for as much as $400 while copies without the game have sold in the $200-300 range. The Dragon Age: Inquisition - Inquisitor's Edition includes a number of collectable items including a cloth map of the game world Thedas, 72 tarot card deck with Dragon Age artwork, four map markers, badge, quill and inkpot, Inquisitor's Journal, Coins, a steel case to hold your copy of the game, a DLC code for multiplayer items, and finally a copy of the deluxe edition of the game. Loom Box Art for Atari ST and IBM PC. Loom is a fantasy-themed graphic adventure game developed by Lucasfilm Games in 1992. It was developed using the SCUMM adventure game engine that was originally created for Maniac Mansion band then later used in a number of Lucasfilm games. The game had a unique premise and gameplay features to solving puzzles that differed from traditional adventure games. Players take on the role of a young weaver named Bobbin who must destroy a great loom and rescue his guild and save the universe. The game is one of the classic adventure games from Lucasfilm that should be on everyone's playlist and its collectability is a testament to that fact. A sealed copy of the game with 5.25" floppy disk has sold for as much as $400. Sellers of used boxed copies can probably expect to get anywhere from $75-$100+ depending on condition. Non-PC platform editions and loose copies can be found for $20-40 range. Ultima Trilogy Box Art (front & back). Ultima Trilogy is a compilation of the first three Ultimo games, Ultima I, II and III, which was released in 1989 for the Apple II, Commodore 64 and MS-DOS. A sealed/unopened copy of the complication recently sold for $403, used boxed copies have sold for considerably less in the $100 range while loose versions will cost collectors around $25. When it was released in 1983, Ultima III: Exodus had groundbreaking graphics and gameplay. It was the first computer role-playing game to have animated characters and allowed players to control the actions of the entire party of four characters rather than just one. It was also the first game published by the newly created Origin Systems. While the game can be found in numerous Ultima compilations the original version, along with the other early Ultima games, are quite collectible and sought after. A recent sealed/unopened copy of Ultima III sold for $403 making it the 11th most valuable PC game. Opened/used boxed copies seem to sell in the $750-150 range depending on condition while loose copies go for around $25-35. The Witcher 3 Wild Hunt Collector's Edition Box & Contents. The Witcher 3: Wild Hunt was released in 2015 and is the third game in the popular action role-playing game series The Witcher. In the third installment players once again take on the role of witcher Geralt as they adventure in a game world that is significantly larger than either of the previous two titles. All games in The Witcher series have received favorable reviews and commercially successful which has pushed the limited collector's edition into the $400 dollar range in the secondary market with the recent high price of $405. There are a few that have sold in the $200-300 range even though there are a fairly high number of active listings. Akalaberth Box Art and Screenshot. Akalabeth: World of Doom is a computer role-playing game created by Richard Garriott who later went on to create the Ultima series of role-playing video games. It is actually seen as the first game in the Ultima series and is included in the 1998 Ultima Collection release. Developed when Garriot was still in high school the game was written in Applesoft BASIC for the Apple II computer and is one of the first known computer role-playing games ever released. The original Apple II version that recently sold for $420.75 is one of those truly rare finds and a very collectible piece for computer game enthusiasts and collectors. The 1986 Box Art and Original Booklet cover for Ultima I. Coming in as the 10th most valuable PC game yet another Ultima game designed by Ricard Garriott, Ultima I: The First Age of Darkness. Ultima I is officially the first game in the Ultima series of role-playing games and was released by California Pacific Computer Co in June 1981. The game centers around the players trying to find and destroy the Gem of Immortality which possessed by an evil wizard who has enslaved the world. The game was re-developed and re-released in 1986, and while both games have become collectible it is the 1981 version that highly sought after. There is a current listing on Ebay of the original with an asking price of $1400 but the only recent sales are of the 1986 version. An MS-DOS copy of the 1986 version has sold for $432.54 while boxed copies for other systems sell in the mid-$200 range. Ultima II The Revenge of the Enchantress Box Art. Ultima II Revenge of Enchantress which was released in 1982 is the last of four Ultima games and five Richard Garriott games on the most valuable PC games list. Ultima II Revenge of Enchantress included a cloth map of the game world and was bigger in scope than the previous Ultima I. The game was published by Sierra On-line but was the only Ultima game they published due to a dispute with Garriott that eventually led him to found Origin Systems. It was also the first game to be ported to MS-DOS from the Apple II version. A full and complete copy with all 5.25" floppy disks, cloth map, manual and other items sold for $443.00 making it the eighth most valuable PC game. Other copies that have sold vary in price based on condition and completeness. Fallout 3 Survival Edition Contens & Box. Fallout 3 is the third major release in the Fallout series of post-apocalyptic games and is the direct sequel to Fallout and Fallout 2. The storyline takes place in the year 2277, some 200 years after a great war between the US, China and the Soviet Union that has turned the world into a wasteland. The Fallout series has remained popular even after the 10-year wait between Fallout 2 and Fallout 3 and this popularity can be seen in the collectability of some of the game's editions. The Fallout 3: Survival Edition was sold exclusively through Amazon.com and contained a number of collectible items including a metal Vault-Tec lunch box, Vault Boy Bobblehead, Art of Fallout 3 hardcover book, and The Making of Fallout 3 DVD. It retailed for $120 and it is now selling for 3-4x that in the secondary market depending on condition. Complete copies of the Survival Edition are somewhat rare and a recent unopened copy sold for $470.00. Other opened copies have sold for upwards of $200 and there are quite a few sales and listings for the individual items included in the Survival Edition. Pillars of Eternity Collector's Edition Box Art. Pillars of Eternity is the fantasy role-playing game developed by Obsidian Entertainment that was released in 2015 and is considered the spiritual successor to the classic Dungeons & Dragons computer role-playing games of Baldur's Gate, Icewind Dale and Planescape Torment. The game was the most successful Kickstarted funded video game today, raising more than 4 million dollars. The game was released in digital format only but also offered a Collector's Edition for a limited time. This edition is what has become quite collectible in a short amount of time. It does not include a physical copy of the game but does include a map of the game word, notepad, playing cards, game guide, mouse pad, and t-shirt. A recent sale of the collector's edition signed by the development team sold for $499.00, but one can expect a non-signed new version of the collector's edition to go for $200-300. Mortal Kombat & Mortal Kombat II Box Art. Mortal Kombat & Mortal Kombat II is a compilation release of the first two games in the Mortal Kombat series of arcade fighting games. It includes the PC port of the arcade version of each game which has very accurate gameplay and graphics when compared to the arcade versions. A recent sealed and unopened big box copy of the compilation sold for $500.00 making it the fifth most valuable PC game. Other copies, both loose and open boxed, have values that are fairly close to the new in box price, selling from $360-$460. The various version of Maniac Mansion box art. Maniac Mansion was a graphical point and click adventure game developed by Lucasfilm Games. It was the first game developed and published by Lucasfilm and initially released for the Commodore 64 and Apple II systems. The story revolves around a teenager who enters the mansion of a mad scientist as he tries to rescue his girlfriend. The game was well received by critics and its value as the first game from LucasArts can be seen in the prices seen in the secondary market. A recent copy of the Commodore 64 version sold for $676.66 while PC versions go for around $200. Commander Keen: Aliens Ate My Babysitter! Box Art (front & back). Commander Keen is a side-scrolling platform game released by id Software over six episodes in 1990-1991. In the series, players control an 8-year old boy who takes on the identity of Commander Keen as he travels through space. Aliens Ate My Baby Sitter! was the last and is the rarest of the games to be found in boxed format. It also came in both 5.25" and 3.5" floppy formats with a recent copy of a boxed 5.25" floppy selling for $1025.00 which is good for the third most valuable PC game. Zak McKracken and The Alien Mindbenders IBM PC & Amiga Box Art (front & back). Zak McKracken and the Alien Mindbenders was the second graphical adventure game developed and published by LucasArts Games in 1988. It was developed for the Commodore 64 and IBM PC/MS-DOS computer systems. The story for Zak McKracken and the Alien Mindbenders is set in 1997 and centers around tabloid newspaper reporter Zak McKracken as he and his companions try to thwart an alien invasion where aliens are slowing reducing the intelligence of the human race through the use of a Mind Bending Machine. The game is considered by many to be one of the best adventure games of all time and the value for original collectible copies reflects that, with a recent sealed, unopened copy of the IBM PC version selling for an astounding $3,050.00 at auction. Opened and loose copies will cost you considerably less but be sure to be on the lookout for any boxed, opened or unopened copies as this is the second most valuable game. If you've never tried this one out before then you're in luck as it was re-released in March 2015 on the gog.com digital distribution platform after being unavailable for a number of years and will only cost you $5.99. World of Warcraft Collector's Edition Box & Contents. The most valuable PC game is not a very hard one to guess as it comes from one of, if not the, most popular PC games over the past 10 years or so. There were only a limited number of copies of the World of Warcraft Collector's Edition made by Blizzard and they have long been sold out. The World of Warcraft Collector's Edition included the full version of the game on CD and DVD-ROM, online CD-Key, a behind the scenes DVD, The Art of World of Warcraft hardcover book, cloth game world map, soundtrack CD, an exclusive digital in-game pet, game manual and special CD-Key for a friend to try the game for 10 days. Copies of the World of Warcraft Collector's Edition can be found on the secondary market on a fairly regular basis, most at prices many consider to be over inflated. The fact that they seem to sell at these prices means there is a market out there for them. Unopened/sealed copies with working CD-Keys can fetch over $4000, with a recent copy selling for $4,304.00 making it the most valuable PC game. Used copies without valid codes have sold in the $1,000 range.